BARCELONA, Feb 27 (Reuters) – The next billion people to connect to the internet in developing countries will do so largely via smartphones, prompting a battle that could favour low-price Chinese manufacturers like Huawei and ZTE over market leaders Samsung and Apple.Fixed-line telephone networks are often weak in emerging markets and building new ones is expensive, and so smartphones are becoming a vital way to connect populations to the web and bolster economic growth. Consumers in markets from Nigeria to Indonesia are hungry for features now standard in the United States and Europe that allow them to tweet or watch video on the go. The challenge for smartphone makers is offering those features at a price local populations can afford. Manoj Kohli, chief executive of Indian operator Bharti Airtel, said emerging market consumers were ready to leapfrog basic phone models and go straight for smartphones, but that prices could not come down fast enough. “People in the developing world are going straight to the mobile Internet,” he said in a keynote session at the Mobile World Congress in Barcelona. The focus on low-price smartphones could step up the challenge to market leaders Apple and Samsung , which are best-known for their top-end iPhone and Galaxy S3 models. Lenovo, known for its PC business, has quietly become the fifth-biggest smartphone maker in the world by almost exclusively focusing on a single market: its home country China. It is now expanding into Indonesia, India and Russia in a bid to appeal to the rising middle classes there. And Huawei and ZTE have built share by bringing features pioneered by Apple and Samsung such as touch screens, fast processors and better cameras to the market at prices around $100. The opportunities in emerging markets appear huge. 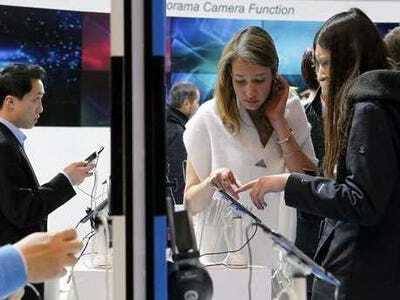 Just 4 per cent of Africans had smartphones in 2012, according to research group Informa. The figure was slightly higher at 11 per cent in the developing countries in the Asia Pacific region. In comparison, North America had the highest take up of web-connected phones, at 47 per cent. Between 2012 and 2017, telecoms consultancy Ovum expects that there will be 1.6 billion new mobile connections across the world, with 61 per cent of these coming from Asia-Pacific. Africa will be the fastest-growing region, with mobile connections growing at a compound annual rate of 6.5 per cent. Lenovo’s Chief Executive Yang Yuanqing said strong price competition among Chinese players had resulted in a smartphone boom in the country of 1.3 billion. Of all the phones sold in 2012, he said 70 per cent were smartphones, and he’s looking to repeat the trick elsewhere in Asia and Russia. “We have been very successful in China, so we know how to win in emerging markets,” he told reporters. He pinpoints a problem for the big players. Top-end devices, like the iPhone and Galaxy S3 attract subsidies from network operators in Europe and the United States, hiding the cost of around $500-600 over a two-year contract. Such deals are much harder to find in emerging markets. The result of a lack of subsidies means the appeal of a phone largely comes down to its upfront cost, which combined with the Chinese companies’ growing ability to match and in some cases surpass the technical specifications of the market leaders, could prove troublesome for Apple and Samsung in emerging markets. Ben Wood, chief of research at CCS Insight, said the Chinese players, which also include TCL Corp, were already raising concerns at Samsung, which leads the Chinese market. Companies like Nokia, Samsung and Apple are not standing still, however. Nokia, which has for years been strong in emerging markets with basic devices, is introducing new lower-priced phones with email and basic web browsing to target consumers in Africa and Asia-Pacific countries in particular. At the same time, though, Chinese manufacturers like Huawei and ZTE are trying to shake off their copycat reputations by introducing marketing slogans and top-end devices in Barcelona. Huawei’s Ascend P2 is billed as the fastest smartphone on the market, and has other innovations, such as power saving technology, priced at 399 euros. Wan Biao, chief executive of Huawei Device Co, said the high innovation level in the Ascend P2 had already started to attract the attention of operators. France Telecom’s Orange appeared on stage at the launch. It will sell the device in France from June 2013. The operator’s VP of devices, Yves Maitre, said Orange was placing a bet on Huawei just as it had in the past with Apple and Samsung.